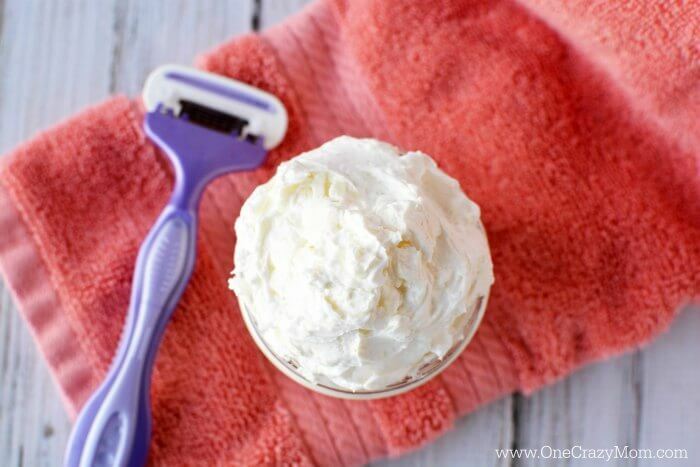 Learn how to make natural shaving cream. 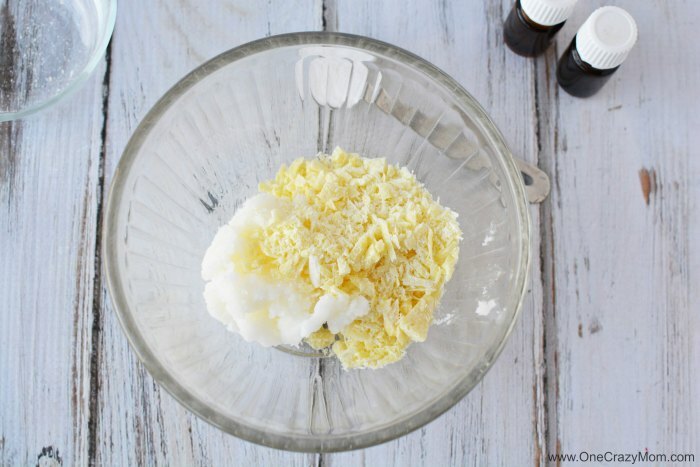 This DIY Shaving Cream for Women is so simple and easy. You will love how moisturizing it is! Your skin will feel so silky and smooth! Get a closer shave with this all natural shaving cream. Forget about buying store bought shave gel. 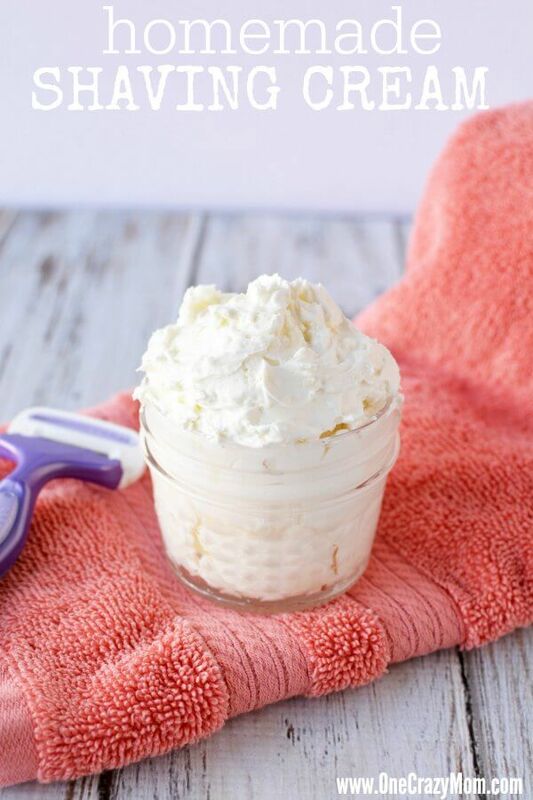 This Easy Homemade Shaving Cream is incredibly simple to make and comes together in just minutes! It’s perfect for sensitive skin and you only need a small amount to get the job done! We are trying to make more and more of our products at home. This Natural Shaving Cream does not disappoint. It leaves skin so silky and you can get a really close shave. You are going to love this shaving cream. It hasn’t happened over night but with each new natural recipe we try, it’s another step closer to using all natural products! We have made The Best All Natural Cocoa Butter Lip Balm, DIY Body Lotion , DIY Bath Bombs Recipe and many more! I love being able to control what goes into our products. It’s such a good feeling. Plus, it’s cost effective too. I find that I can make these all natural products for a fraction of the price of store bought. It’s insane the mark up in retail stores! Try making some of these products at home and I bet you love them! You could even get a few friends together and make several of these all natural DIY recipes. Each person could take home one of every recipe that was made. Such a fun idea and even better to spend time with friends. Even the kids could help with these simple recipes. 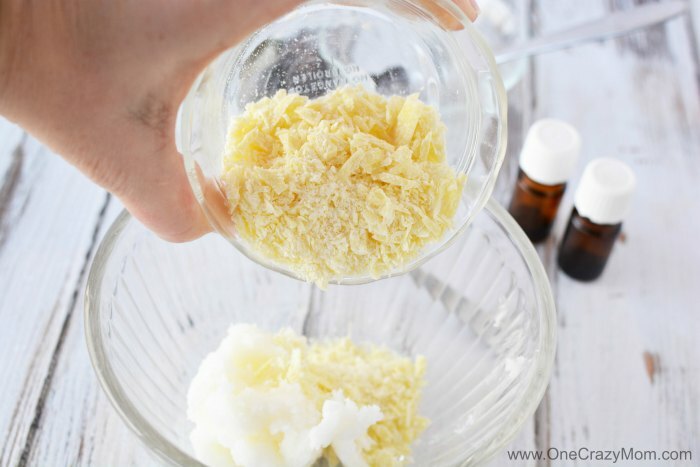 Let’s get started making Natural Shaving Cream! It helps to cut down on cost because you can wash and reuse these jars. So handy! 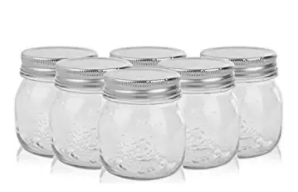 These jars are also perfect for Lemon Sugar Scrub. We are always making something around here so I like to buy a big box of jars. They are normally cheaper that way and I also save time by keeping them on hand. So handy for all my projects. 🙂 Plus, the clear glass allows me to see what is inside and looks so pretty. 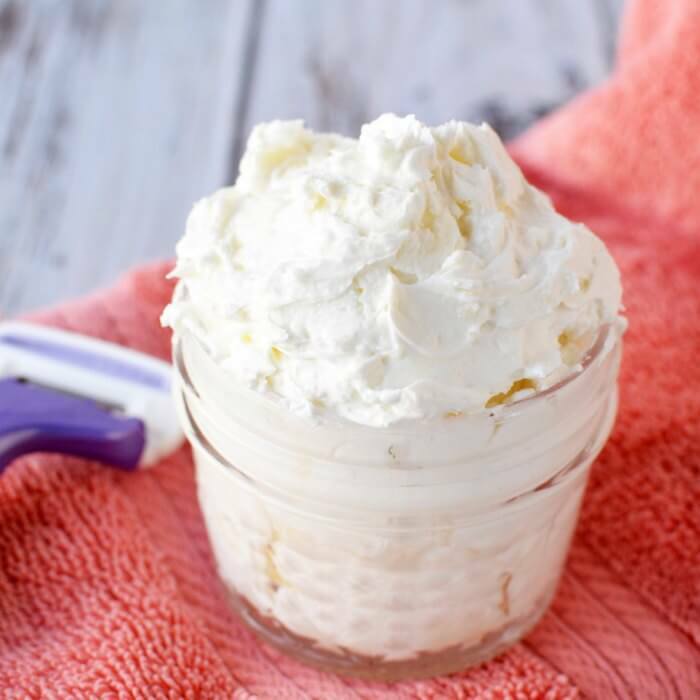 This easy homemade shaving cream is my favorite! I love to add essential oils to this shaving cream. However, you can make it with or without essential oils. If you have skin that is easily irritated, you can always mix in some oils that are especially good for skin such as Lavender. We just love essential oils and have learned so much about them. From Essential Oils for Allergies to the Best Essential Oils for Relaxation and Essential Oils for Hair Growth, we have seen so many ways to incorporate essential oils. There’s one downfall to this. It makes your tub slippery. Just be careful in it as well as the following day. My favorite part is that you can smooth it on, shave your legs and get out and not even have to apply any moisturizer to your skin because it’s so smooth from the oil. I love products that pull double duty. 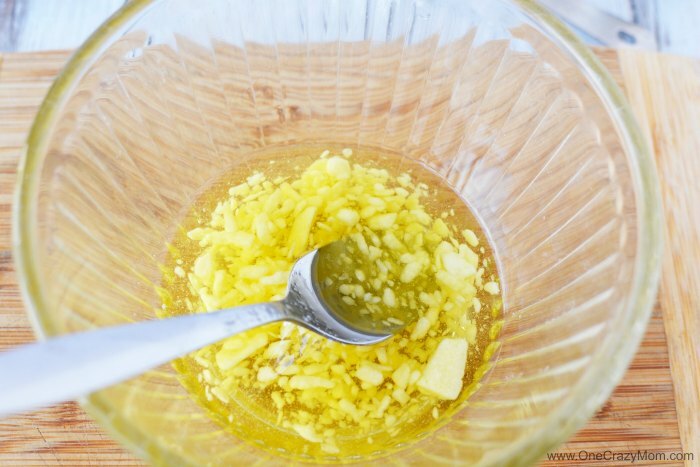 Now if f you still feel like you need lotion, try this easy DIY Body Lotion. 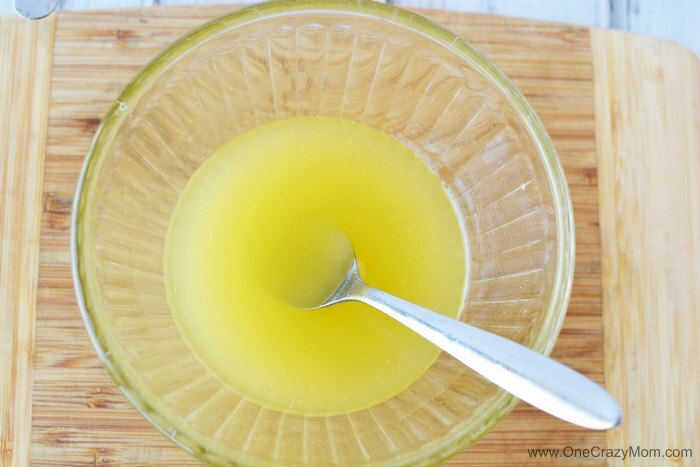 So easy and your skin will be so soft! It feels so luxurious. 1. Place cocoa butter and coconut oil in a microwave safe bowl. Microwave for 20 seconds and stir well. Return to the microwave and stir for 20 seconds, continuing to stir until all of the cocoa butter is melted. This may take a minute or two. Be careful to not cook it too long. You will want to keep a close eye on this as microwave times do vary. I wouldn’t walk away while as it’s heating. 2. 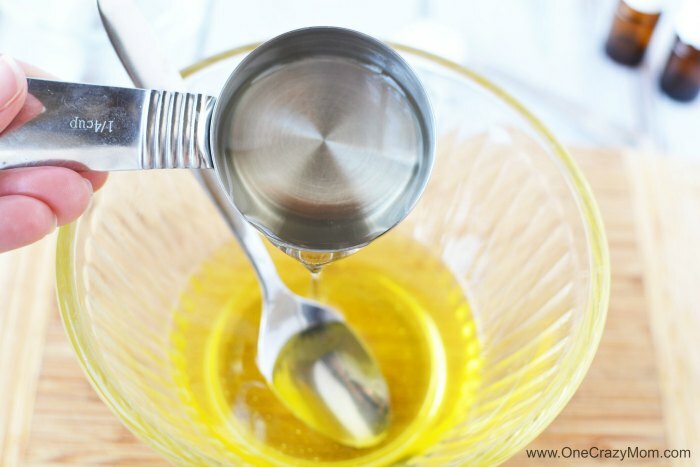 Stir in almond oil, baking soda and essential oils. 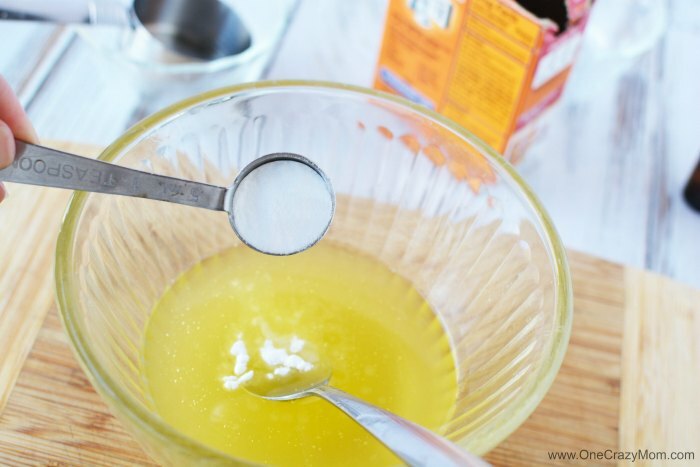 Remove the spoon from the bowl and refrigerate for 1-2 hours or until mixture is solid, the consistency of Crisco. 3. 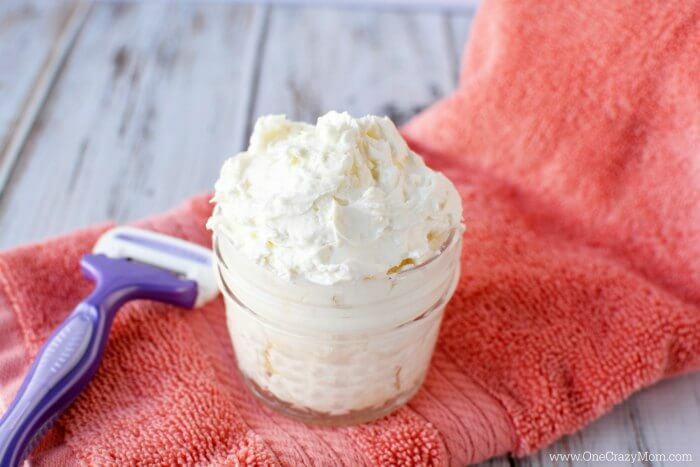 Use a hand mixer to whip the shaving cream until it is fluffy, about 2-3 minutes, making sure you scrape the sides of the bowl down while mixing. I use one of these spatula’s and it’s easy to get every last bit in the bowl. 4. Spoon into mason jars and cover. It’s that simple! Wet your skin and grab a small handful of shaving cream, about the size of a quarter. Smooth onto your skin and shave as normal. You’ll find a little shaving cream goes a long way. This natural shaving cream lasts forever! This won’t foam like typical shaving cream, but it will coat your skin well. You may find that you don’t need to reapply. You can most likely go over your skin 2-3 times and not need to add any additional shaving cream. Rinse before towel drying. Just remember to be very careful as this will leave your shower and bathtub very slippery! Keep this in mind if your child gets in the tub after you or even the next day. It could be extra slippery and you don’t want anyone to fall. Maybe one of these non slip tub mats would help. 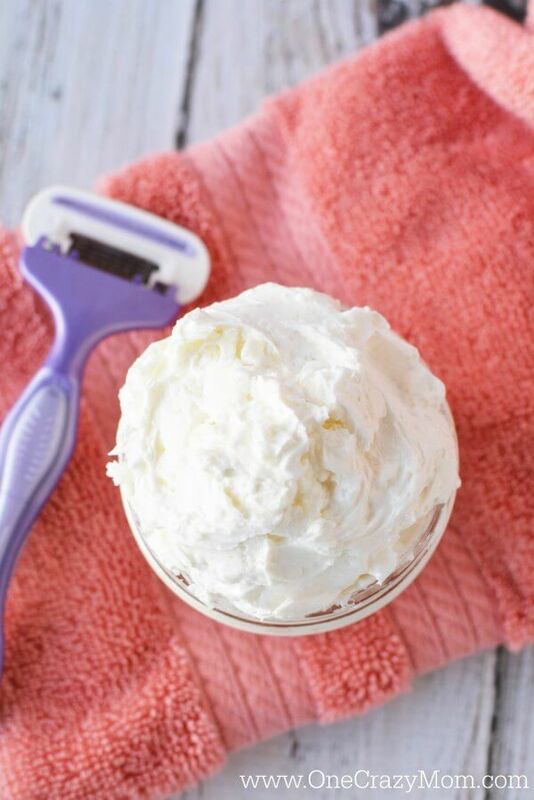 This easy Homemade Shaving Cream is so soft and luxurious! You will feel like you have been at the spa and pampered! This all natural shaving cream provides a close shave and leaves your legs silky smooth! Once you try this natural shaving cream, it will be hard to go back to store bought versions. 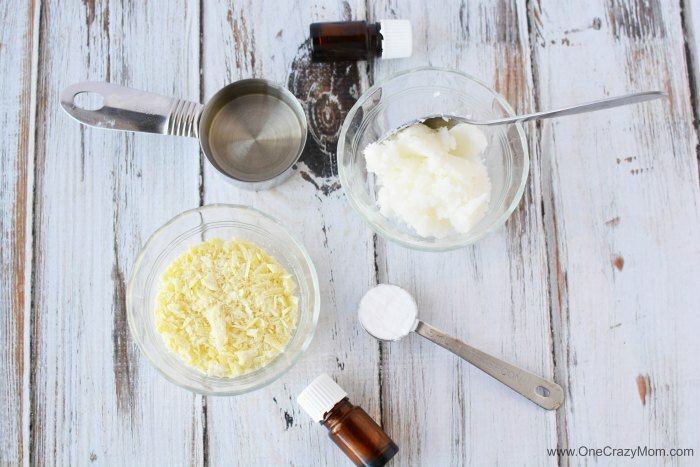 This DIY shaving cream for women does not disappoint. It’s awesome! Make sure you have a good razor. I have been having a lot of luck finding sales on Amazon for nice razors. Don’t pay regular price. Razors go on sale all the time at drug stores or Amazon. This is one item I can always get a good deal on. I try to never pay full price. How do you make shaving cream? I’m always looking for new ideas. 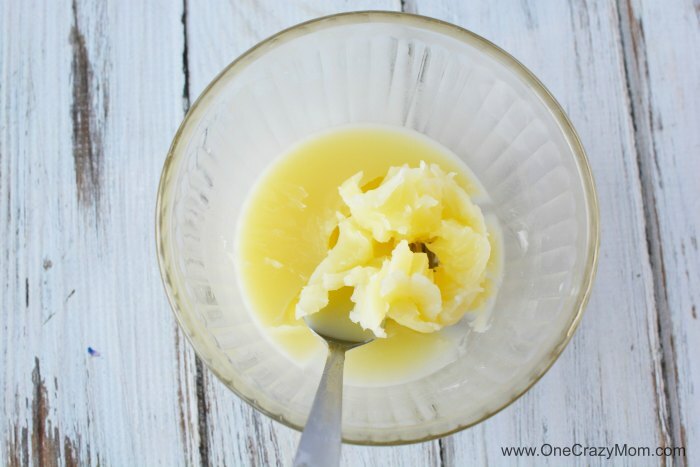 I spotted this DIY Homemade Shaving Cream with mango butter. I bet that smells amazing! You could probably experiment with different types of essential oils to give this shaving cream different varieties. 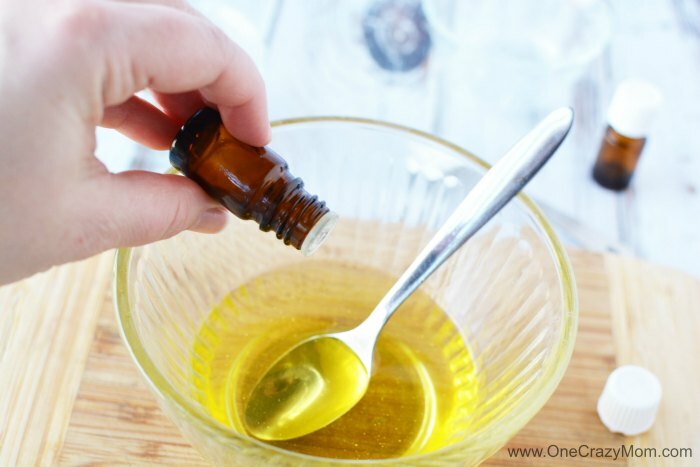 If you are new to essential oils, learn how to use essential oils here. So many great uses! Leave us a comment with how you have tried making shaving cream. We are always trying new all natural recipes around here! I love learning new ways to give my family natural products. It saves money and keeps all the chemicals and less desirable ingredients out of our house. A win for us all! Don’t stress over trying to do it all at once. Pick an all natural product to try each week and go from there. It didn’t happen over night for us. It’s easy to get overwhelmed if you try to convert all your products into natural ones in one day! Don’t do that! Just take it one DIY recipe at a time. Let’s face it….mom’s don’t have a lot of time! Do what you can and don’t stress over the rest. 🙂 You will love these easy recipes because they are very simple and don’t take much time to make. Perfect for busy mamas!